The mountains of northern Tuscany are varied and beautiful, and in war torn Italy between 1943 and 1945 the mule paths that lead through them served a particular purpose. They provided escaped prisoners of war, partisans and commandos with a means of travel that, most of the time, kept them away from enemy troops. The more inaccessible the route, the more likely it was to be free from enemy patrols. Because of a scarcity of metalled roads in those days, the network of mule paths was very extensive, and was the commonest way of travelling between one village and another, or one valley and another. The valley of Rossano, which is the centre for the trails that the Foundation organises, was a gathering point for escapers hoping to find their way to freedom. Between the summer of 1944 and April 1945, over four hundred escapers passed successfully down the escape line and through to Allied territory. Virtually every year since 2003, the Foundation has arranged walks for all comers from the Rossano valley through the mountains to “freedom”. You can read accounts of some of the walks below. In essence there are two main escape routes from the valley of Rossano. The walks usually take place in September. Many different variations are possible. 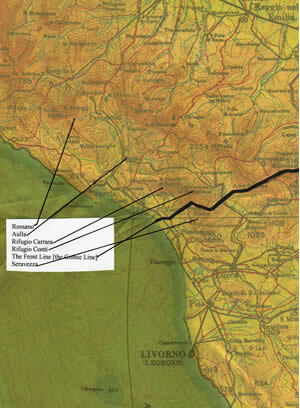 The “easy” route is from Rossano to the coast, at the Cinque Terre village of Vernazza, or the town of Levanto. We usually start from Pontremoli on Day 1, and walk up to Rossano. Then, on Day 2, we walk to the courageous village of Sero, and then on to the coast on Day 3. We vary the route from year to year. This was a route used twice in 1944, in an attempt to lift the escapers off by sea. Although the escapers successfully made their way to the sea on each occasion, the craft that had been despatched to pick them up failed on both occasions to make the rendezvous. The hard route is from Rossano to Seravezza, over four days. This route is for experienced and very fit walkers only. Days 3 and 4 are very spectacular but tough. That said, the Chairman finally completed this walk in 2007, at the age of fifty-eight, so it is far from impossible. It does however depend upon decent weather. If the clouds come down, Day 4 is impossible. The trail descends from the valley of Rossano via the Alta Via to cross the river Magra, and then rises up through the spectacular marble workings used since Roman times to retrieve Carrara marble until it passes over Monte Altissimo, and descends through the old front line to Seravezza.